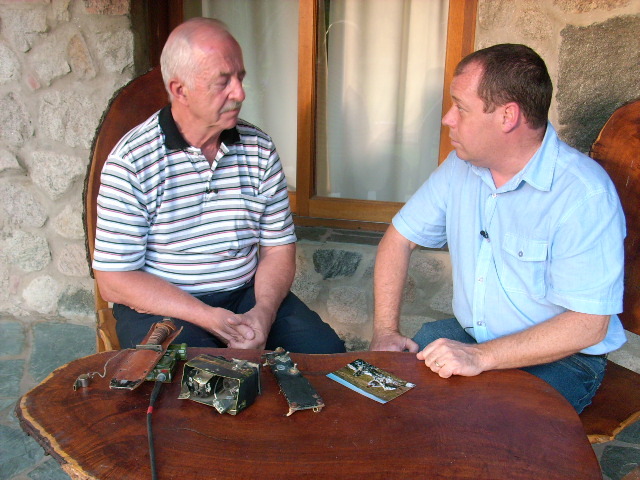 Neil Wilkinson, The Battle Story of the Falklands War in 1982 as he was meeting the enemy. Neil Wilkinson on his 21st Birthday Neil Wilkinson tells his battle story of the Falklands War and how he shot down an Argentinean Pilot, Mariano Velasco. Neil Wilkinson le dice a su historia de la batalla de la Guerra de las Malvinas y la forma en que derrib un piloto argentino, Mariano Velasco. The Documetary Mission is Complete and has been shown on the BBC channel, locally, on Jan 16th 2012. But the 1892 battle story about Neil Wilkinson and Mariano Velasco has taken a whole new direction instead of a battle, it is now peace. The program was a big success and Neil and Mariano finally did meet after thirty years. The following is a letter from Neil referring to the BBC television documentary Meeting the Enemy.. I saw my first taste of the programme last night, it was a trailer and it had 3 clips. The first was of me checking in at the departure lounge, the next at the crash site, then the last was of me walking up to Mariano and the last one had me wincing. Purely because I walked up to Mariano and he held out his hand and I never shook his hand at that time and I virtually hugged him to death! I was looking at it and my wife said that it would have being nerves and she made some other excuse for me, I did not stop shaking his hand, it was a very moving piece of filming and one that will change the history books slightly! So far I have a few appearances coming up, Breakfast Time TV on the Monday 16th, then a couple of Regional TV and Radio interviews to do. All of these I will get recordings of and add to the ever increasing amount, I am hoping that a daily newspaper comes forward and wants some info etc, this will give everyone a piece of the action as well. As you can see things are moving along and time never stops. The next project is Enemy Contact, the Movie. 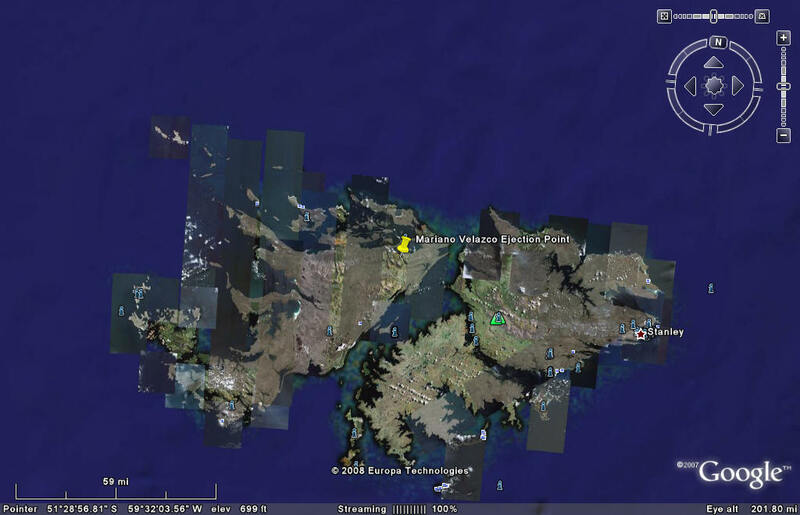 These were the plans to complete the Falklands Project which started in November of 2008 and was completed on January 2012. A message to the readers. This is a story of how a British Sailor, Neil Wilkinson, shot down Mariano Velasco, the Argentinean Pilot who sunk the HMS Coventry. The plane is shown below and the cannon shell is also shown here too. The Falkland Island War was in 1982 and in November 2008 Neil Contacted me and by 2009 we are planning an expedition to the Falkland Islands, called "When Enemies Become Friends", to find this crashed airplane. We also want to get a photo of Neil and Marino standing together more than twenty years later. Signing our guestbook would be a great support. Also, if you were in the Falkland Islands War, on either side, please write the webmaster a letter at the bottom of this page. This will be a great help for recognition of all of the veterans on both sides. Thank you very much. English Language Video, "Meeting the Enemy: The Falklands War 30 Years"
During my journey down to the Falklands I originally was part of the three man guns crew but not the aimer, I usually took the loaders number or supply mans job. We had a lot of time to practice on our way down and as we went south the weather got warmer. The drills included a lot of practice against the clock, which meant things like barrel changes had to be done within a set time, miss-fires had to be dealt with super quick because there would be very little time to stop and think. So as we sailed down to the Falklands we also had live firings against 50 gallon oil drums. We all took turns to see who could get close or even hit the things bobbing up and down in the water. I was last to go, I took aim and opened fire on the barrels, I got the aimers job after that shoot. Everybody on the ship did the same every day on the journey down there, drilled, cleaned weapons and basically fine tuned themselves for what was coming our way. We obviously had no idea what to expect, when it is an exercise there are a lot of restrictions and regulations to go by, when in a war situation, a lot of the regulations go out of the window, but you still have to remain professional. When we closed up for Action Stations through the night it was really cold and very dark, there wasn't a lot to see. Because we were out on the bridge wing of Intrepid we couldn't hear what was being said, so I had an agreement with the Radio Operators that they would hold up pieces of paper at the bridge windows which would alert me to any incoming aircraft. As it got lighter and we could see the land it was really strange, there was no gun fire or helicopters attacking us, we had a clear run into the anchorage. The only thing we could hear was the anchor chain being slipped, then it was a case of try and get everyone and everything off the ship before the attacks came. The ship ballasted down and the four landing craft inside slipped out, full of paratroopers and equipment, it was getting lighter now and we could make out more of the land, I only had a 90 degree arc of vision, on one side there was the bridge and on the other side was my gun barrel. The gun itself worked by an electrical scooter, when the two levers were slid down the scooter the motor would start, the gun moved by either turning left or right of up and down for elevation and depression, the trigger was on the scooter. We were told that aircraft were in the area and to keep our eyes peeled, it wasn't long before the attacks started, because of the number of ships in San Carlos and the height in which the Argentine aircraft came in to attack meant it was sometimes difficult to get a shot off at them. The Frigates and Destroyers took a hammering from the aircraft, but it wasn't all one sided. I really thought and wondered if I could and would pull the trigger! When in training there is not the same sense of fear or urgency to survive, when it is for real, you open fire! Time is irrelevant, family and friends do not enter into your mind, the adrenalin is pumping through you, you don't want to be next. I opened fire as many times as I could, mainly when the aircraft were passing after an attack, they would come in at some ridiculously low height and I have to take my hat to them they were very brave and courageous. On the 23rd May a group of six Mirage bombers came around the corner and I opened fire on them, I could see my tracer either going in front of the aircraft or just behind. As all the aircraft were trying to escape, one of my shells hit the back end of a Mirage, I saw bits fly off it as it sped past, approx about a mile away from us. That was a very scary moment, because as I opened fire on these aircraft, a large explosion occurred just off the starboard bow. The water cascaded high into the sky and I said to my loader "George what was that?" He replied in his Geordie accent "I don't know". I said "Don't tell me they can fire sideways now?" We found out afterwards that our sister ship Fearless had fired a Seacat Missile from way down in San Carlos and had lost control of it. The missile went between our ships masts and plopped in the sea just off our starboard bow, that was a very near miss! My Captain credited me with the Mirage. As the hours went by, it was wave after wave of aircraft, as soon as they had dropped there bombs they had to get out of there fast, the after burners went on, but that used up valuable fuel which would be needed to get them home. We were brought food and chocolate bars to eat, most of the time the food was brought to us and it would be thrown on the floor because an air attack would start. After thirty one and half hours sat in my gun, we were allowed to relax slightly, but it is an awful time. What you have just witnessed is locked away in your memory vault and the adrenalin rush you were on is now subsiding, it is a massive come down. I needed to sleep, I couldn't careless about food or a shower, sleep was required. I found a locker and opened it, went in and decided I would write to my family first, this was to be a sort of last will and testament. The writing was so small it was hard to say it was me that had written it. After writing the letter I sat and reran the events of what had happened, it was all too much to take in, two years previous I had being sailing around the Med and West Indies, now I was in a theatre of war! I sat there and broke down in tears, I am sure many men did the same and still do today. The days seemed to have a familiar pattern, air attacks through the day and then at night we would take the SAS out on special ops. The next morning we would be back in San Carlos at anchor, ready for the next wave of attacks, which were coming. On the 27th May, it was a really strange day, nothing much had happened until late afternoon. I never went far from the gun and I was sat on a box of ammunition doing a word search in a magazine, when the shout came up to "Stand Too" which meant we were under attack. 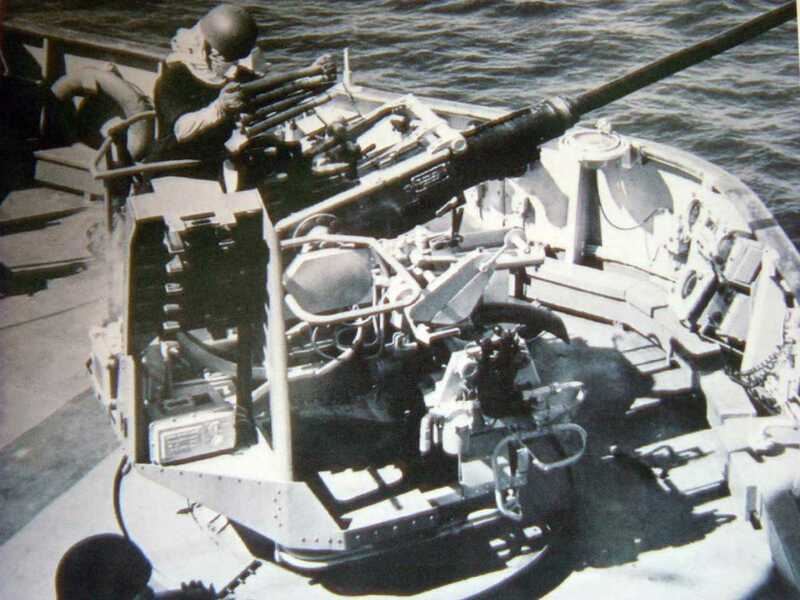 The ship was facing down towards the south of San Carlos and the barrel of the gun facing forward with the ship. 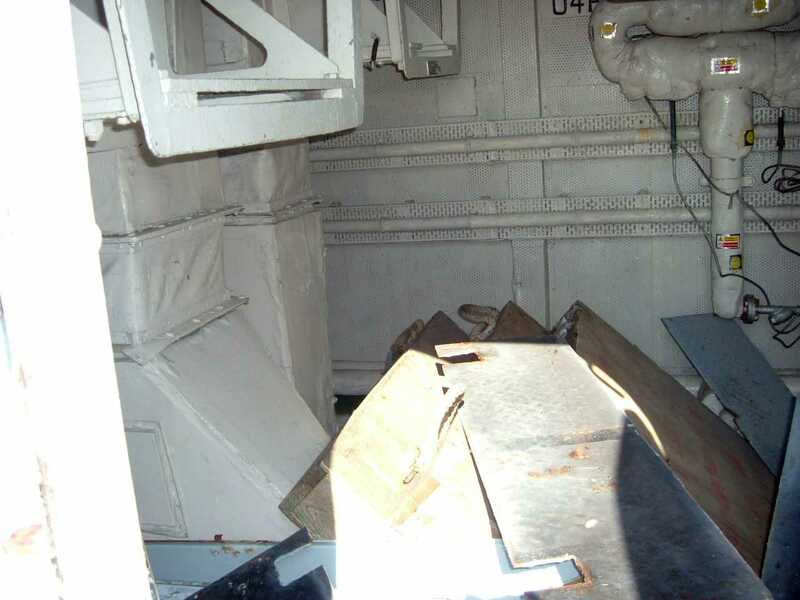 My loader and supply number were talking to the other guns crew around the port side, I threw the magazine up in the air and dashed to my gun, but before I could open fire I had to do the loader job and flick a couple of switches, basically safety measures that had being put in place. Then I started the motor on the gun, by this time I could see two A4 Skyhawks, there may have being more, but I only saw two. I opened fire on these two aircraft, I managed to get six rounds off, the reason why only six is? I didn't have any other crew on or near the gun when I opened fire, so I couldn't load anymore shells into the gun and six was all I had. One of the A4`s was trailing smoke behind it, a couple of the guys on the lookout position gave me the thumbs up, which said to me, I had hit it. I wasn't sure though, I knew I was very close to hitting it. My Commander a couple of days before the attack presented me with a T-Shirt for hitting the Mirage. Looking back at that presentation over many years, I struggled with the idea that I could go to war, kill somebody and all it was worth was a T-Shirt! When the aircraft had disappeared, we had to hang around for quite some time because you never knew if there were more aircraft around or if the ones that had just attacked were going to turn back round and come again. When the war was over and we got back to England, I met the Defense Secretary John Knott and I was presented to him by my Captain. John Knott asked me if I had hit any aircraft and I replied "Yes, a Mirage". Just as I said that my Captain jumped in and said, "No, you actually hit two aircraft", I asked him which one and he confirmed to me it was the Skyhawk on the 27th May. For many years I didn't even think about the pilots or there families, we did a job just as they had done. Until 2007! My wife had said to me that the History channel were running a special week of programs about the Falklands, but I don't usually watch anything to do with the war, I suppose I'd seen enough. But I was curious and with it being a Thursday, I thought it would be something about the surrender or the Marines / Paras. So I put the television on and a story was unfolding of an A4 Skyhawk pilot that had being shot down on the 27th May! Now remembering that on that day, only one attack came in and only one aircraft got shot down. I knew this was my aircraft, I watched the program, by this time the tears of emotion were great, for all these years I had thought the pilot had perished and here he was alive, the footage was old, but still he was alive. It was unbearable, I had to find this man, I did not know if he was alive still or had died of natural causes. It took me 8 months to track down the pilot who's name is Mariano Velasco, we have made contact and are building a firm friendship. The history books state that my aircraft was downed by different sources. The Fearless took ultimate credit for the downing of his aircraft, I now know that not to be correct! I believe that Mariano Velasco was hit by myself and possibly from somebody on the ground. As Intrepid was Fearless' sister ship it was put into the records as her, some records state Intrepid/Fearless. Stories like this, the meeting of two people from a conflict are rare, the possibility of meeting Velasco one day and shaking his hand will happen and I am glad to share this story with you. shot down during the Falklands War. Made by Hobby Master, this 1/72 scale die cast model wonderfully replicates the A4 Skyhawk, C-207, flown by 1st Lt. Mariano "Cobra" Velasco of the Argentine Air Force when he dropped three 1,000-lb. bombs to sink the HMS Coventry during the Falklands/Malvinas War in 1982. It features outstanding details such as engraved panel lines; a detailed cockpit with an opening bubble canopy; removable stores including a bomb, missiles and fuel tanks; an aerial refueling probe and a tail hook; optional position landing gear with real rubber tires; a display stand and more. Measures 6" long with a 4" wingspan and arrives ready to display. This shell is being transferred to the Falklands very quickly for the museum there. Arrangements are being made along with photos and videos. I have found out some very interesting information today! I will tell you first about the pilot then tell you what I have found out at the end. 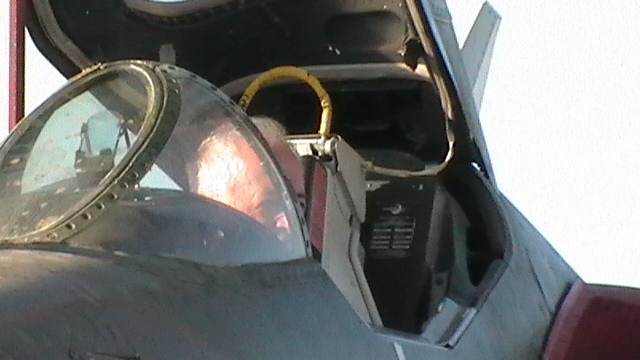 Mariano Velasco flew A4 Skyhawks with Grupo 5 Argentine Air force. He was probably a pilot before I even joined the Royal Navy. Four years before I joined the navy a friend of mine from my home town of Leeds, West Yorkshire, joined the navy as an officer, he became the Gunnery Officer onboard HMS Coventry. 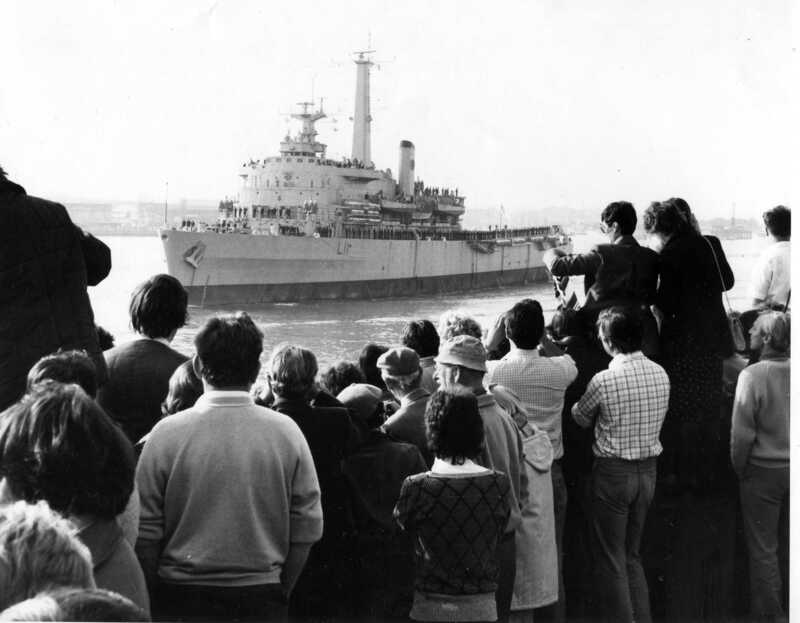 Before the Falklands started I was given my next sea draft, it was going to be HMS Sheffield, Sheffield was sunk by an Exocet, I stayed on my original ship Intrepid. When the Falklands broke out and we sailed there on the 23rd May that year I hit a Mirage fighter and he crashed. On the 27th May Mariano Velasco attacked and I managed to get 6 rounds off at the two planes that were incoming, although another ship eventually got recognition for the hit, it was given to me by my captain as he was on the bridge and saw everything. Mariano Velasco, on the 25th May sunk the Coventry! My best buddy survived, but suffered as we all do. Now the good bit. When I hit Velascohe went over the hill with a lot of smoke trailing from the rear of his aircraft, the history books state he was flying C207, but he was actually flying C215, how do I know? Well the other day I was trawling through a lot of stuff about A4 Skyhawks and came across a site that had C207 in a museum. Many thanks for replying so quickly to my email. The offer of the story is great and I am in contact with one of my friends as we speak about doing a story for you with some pictures included. You certainly seem to have a broad variation of stories on your site? Since finding out last year that Mariano Velasco had survived the A-4 Skyhawk has suddenly become a more fascinating aircraft to me, I have researched quite a lot about the aircraft and think they are a remarkable aircraft. I will now just tell you a brief timescale of events of things that occurred in the Falklands, if you don't mind? The shell is 40/60mm Bofors, that was my gun. This was the shell that shot down Mariano Valsaco. This shell was fired against a group of Mirages, the shell that hit Velasco was fired a few days Later. I was on the starboard battery, I have to admit it made a heck of a bang when fired, I do believe that I could be the last person in the Royal Navy to hit an aircraft with a conventional weapon, that could be one for the Guinness Book of records? 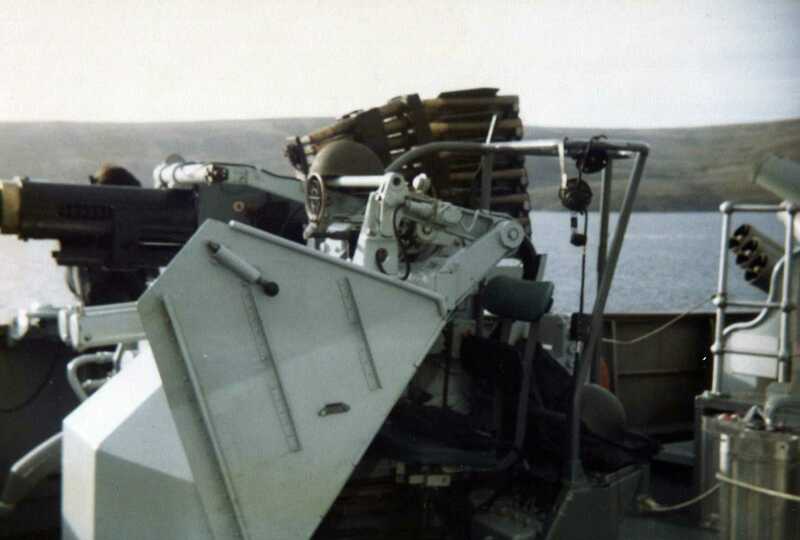 The gun I fired was a single barreled Bofors gun 40mm, it is called 40/60mm purely because the shell casing is 60mm and the shell 40mm, it may be called something different by other navies. On the 21st May we went into San Carlos and off loaded 3 para brigade who had travelled on our ship. Shortly after daylight broke the air attacks started. No amount of training can prepare you for this, it's for real. On the 23rd of May I opened fire on a group of Mirage's (6) and I blew the tail off one of them. Most days were the same, attacks, rest, attacks. On the 27th of May, nothing much happened all day, until late that afternoon. Velasco and his wingman had sneaked through and was now lining up for there attack, I was resting on a box of ammunition. The alarm sounded and I leapt into my gun and as they screamed into San Carlos, I managed to fire 6 rounds off at them. I then saw a lot of smoke coming out from behind his aircraft, he then went over the hill. It wasn't until we got back to the UK that my Captain confirmed to me that I had actually hit the Skyhawk, up until then I wasn't 100% certain. In the history books HMS Fearless took credit for knocking Velasco out of the sky, but I now know different! 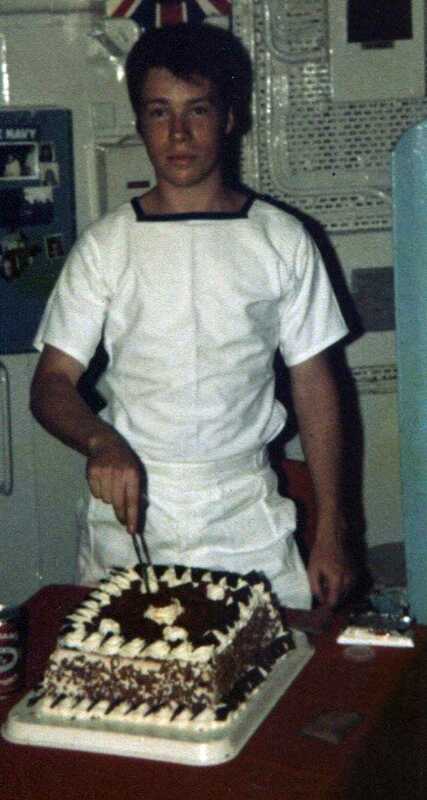 My life after the Falklands took a dive and I suffered from PTSD and a lot of mental stresses due to the conflict. 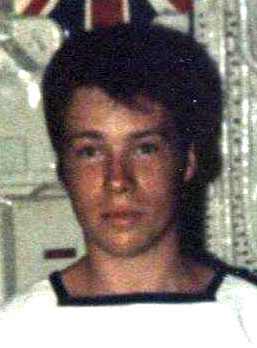 Last year with it being the 25th anniversary I put on a program and found that the pilot in the documentary was in fact the very same pilot I thought I had killed and I decided to track him down. After 8 months of trying I hit the jackpot and we are now in contact with each other, the feeling of guilt was lifted, he has confirmed to me that fearless could not have shot him down as previously recorded. These stories I had heard happen from ex World War 2 vets, but I never thought it would happen to me. 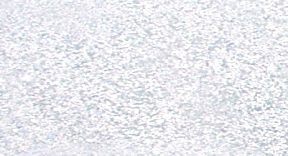 11-24-2008 This is the first letter that Neil Wilkinson sent to the Webmaster at YellowAirplane.com, Jeff Dyrek. 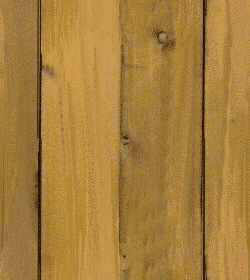 I have just being on your website and found a model that is of interest to me. It is C207 Mariano Velasco`s A4 that flew in the Falklands. I am very pleased to see that he was one of the most successful Argentinean Skyhawk pilots. But on the 27th May 1982 his run came to an end although he did survive. I am in contact with Velasco on a regular basis, we have a lot in common, he flew his plane on many dangerous missions against us. I am hoping to eventually meet him some day in Argentina and shake his hand, I am really glad he survived, after all it was me who shot him down. Here I am sending you my translation of the paragraph about the May 27th. 1982 war facts that is now found online in the official Fuerza Aerea Argentina website. Hope this can help you. And please excuse some translation mistakes. 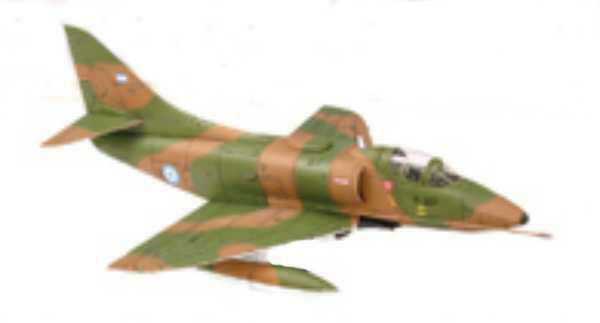 3 A-4B Skyhawk, flight indicative “Truco”, armed with parachute-retarded bombs. Pilots: 1st. Lt. Mariano Velasco (C-215), Lt. Carlos Osses (C-228), Lt. Fernando Robledo (didn't take off given technical inconvenients). Flight took off from Rio Gallegos AB at 1530 hrs. They flew into Falklands Sound (San Carlos Sound) 1 minute after “Poker” Flight, also south-north direction, and confirmed the sighting of 4 ships. They received intense anti-aircraft artillery fire. They dropped their eight bombs over Ajax Bay cooling plant. The Flight turned left, chased by missiles. Number 1 (1st. Lt. Velasco) got hit by a 40mm. Bofors shell from HMS Fearless and HMS Intrepid, in the left plane root. 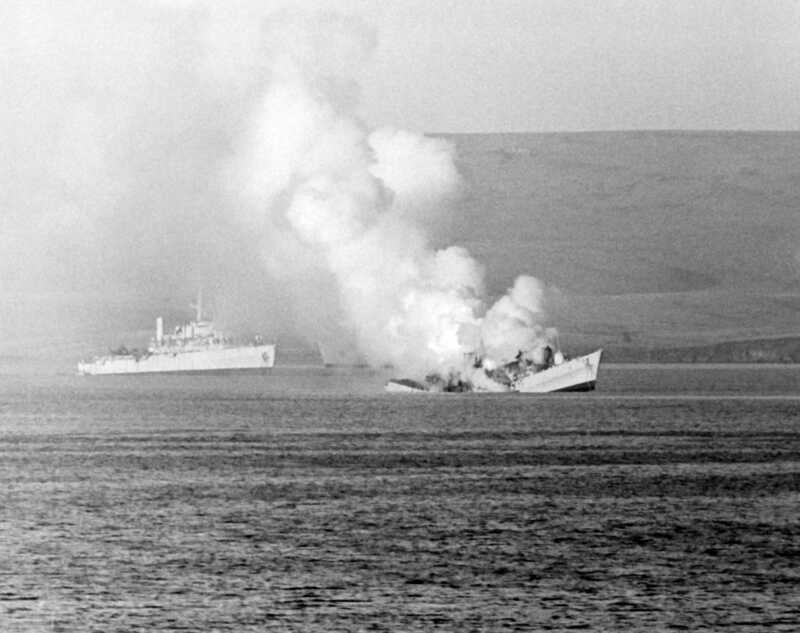 Having crossed Falklands Sound west-bound, and over West Falkland (Gran Malvina), Number 2 (Lt. Osses) saw fire in Number 1 left plane, very close to the oxygen tank; he informed this immediately. Number 1 answered that he had a red light (alarm) on the hydraulics indicator, reason why he exchanged speed for height and informed he was ejecting in position 51 29' S / 59 32' W; it was about 1700 hours. 1st. Lt Mariano Velasco fell between Port Fox and Port Howard. 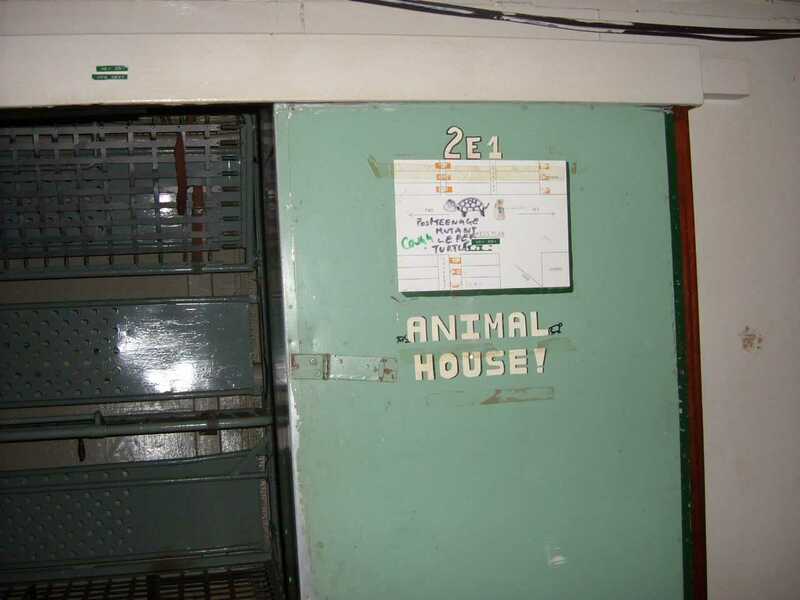 After recovering from the ejection, he walked two days and two nights until he got into an uninhabited house where he found canned food. On the following day two kelpers on horseback passed near the house, he called them and offered to buy them a horse, they refused but they told him they would call Port Stanley. In the afternoon a Land Rover showed up, driven by a kelper and with an Argentinean Army officer on the other seat, who brought Velasco to Port Howard. Lt. Osses came back alone to the continent, with his aircraft damaged by light gun fire. 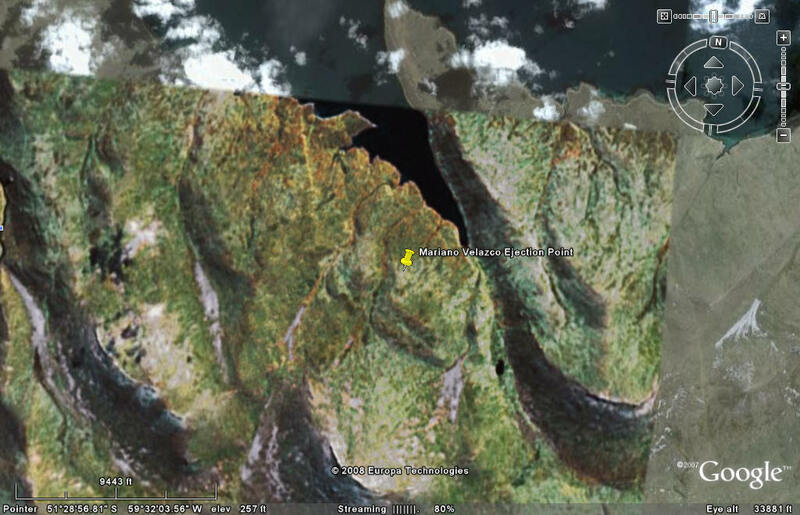 He landed at Rio Gallegos AB at 1800 hours. Hi Jeff, I think a kelper is somebody that farms seaweed! sounds ridiculous but I think it's true or it is another name for a fisherman. Neil. Click Here's a little more clarification on the term "Kelpers" There are huge Kelp beds in this area. Kelp is harvested and then sold commercially worldwide for use in many products from sushi to toothpaste. I have the rough lat and long of where the Intrepid was on the 27th May 1982. 51.32S - 59.04W it is near to where we were, if you look at the bay he came in from about the SE end and when you pinpoint the Intrepid he flew over the hill towards the west. I feel it may help more veterans who do read literature and maybe don't believe in ways round things. So if my story can help anyone who is in difficulty, then I am more than happy to do it. As you say though there have being so many veterans taken their own lives, the Government is now doing something about it, but it is a slow process in the UK. I think the men and women of our countries have a very hard job in who they are fighting and any casualties or fatalities are deeply sad news. It is when they return home that the lack of care is not there for them, and speaking from my experiences they do not treat you with any respect or dignity. I had to talk to a veteran a few months ago and he was messed up, but by the end of our chat although he was no better off, he felt better that he had somebody to talk to and by the end of it all i knew everything he had done in the Falklands, because i was willing to listen and we had a common connection. the pilot of the A-4 Skyhawk that Neil Shot Down . In different ways aware that shooting down my plane had taken place by the firing of cannons HMS Fearless, which seems highly unlikely because the vessels were quite right in my career and the flying height was almost impossible shots of the ship that will impact on the left wing, where the fire occurred. Mariano has had a brief outline of events on that day, but when he does reply to me it's in Argentinean and not English so I have to get it translated. So far he has told me that he did not think that he could have being hit by HMS Fearless because of her position in San Carlos, which does hold an element of truth. 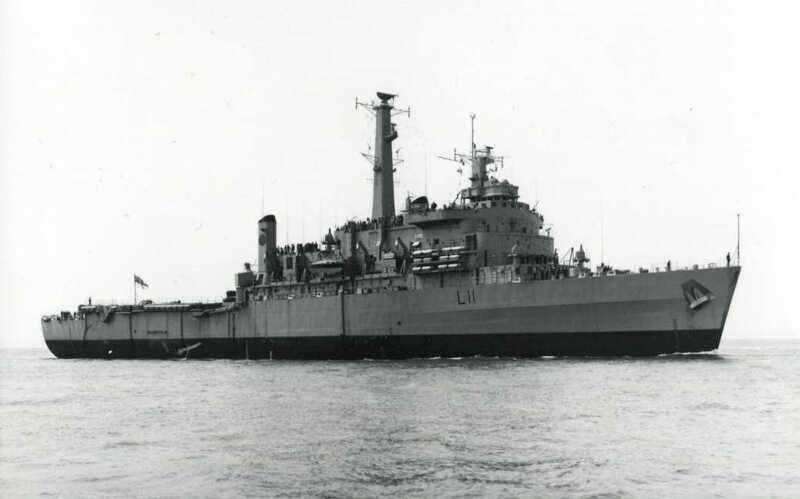 The HMS Fearless was down at the bottom end of San Carlos whereas HMS Intrepid was further up towards the entrance. He told me he was doing roughly 200 knots and had to climb to around 1000 ft. before ejecting. He said that he felt the plane jolting as it was hit, at first under the left wing area, which would discount the HMS Fearless as she was on the right of the plane. Also it could discount the HMS Intrepid initially because it could have being ground fire that hit him. Or it could have being my shell exploding underneath the aircraft! Although the HMS Intrepid was to the right of the planes, we were on a better angle, so as you looked at the aircraft I would be looking at an angle from the nose to 20%, so I could see the left side as well, but he was flying about to evade being hit, so it is also possible that my shell exploded first! The next thing I saw was a lot of smoke coming out of the plane, at first I thought it was after burners, then after a short while we were told it had crashed somewhere. Once the aircraft went over the hills or low lying land we were unable to see them or tell which direction they had gone. The most nerve racking thing was knowing they were coming and then suddenly from nowhere there would be aircraft all over the place. Bombs and rockets were flying about and you could then hear the sounds of our guns and AA fire, the noise was tremendous. GPMG`s and larger AA guns firing, then Anti-Aircraft Missiles being launched, 20mm Cannon's firing, then there would be an explosion as an aircraft took a direct hit. As I said before, I have an utmost admiration for those brave pilots, they flew there aircraft to the limits and paid the ultimate sacrifice. The initial credit and in some books say Fearless plugged Mariano, some say both ships hit him, but I'm not sure Fearless did actually hit him. But according to Quinny a junior seaman on Fearless got the praise for it by his captain, then I got praise for it off mine! But when I look back, I have to admit I was exceptionally close to hitting him and I did think I had , but then the doubts creep in and I dismissed it, until we got back and my captain said I had hit it in front of the Defense secretary. So I don't think he would have said anything if I hadn't hit it!